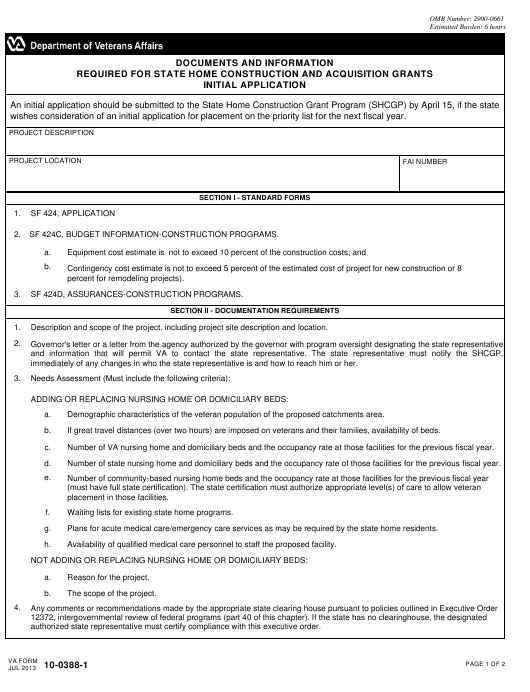 VA Form 10-0388-1 or the "Documents And Information Required For State Home Construction And Acquisition Grants Initial Application" is a form issued by the U.S. Department of Veterans Affairs. The form was last revised in July 1, 2013 and is available for digital filing. Download an up-to-date VA Form 10-0388-1 in PDF-format down below or look it up on the U.S. Department of Veterans Affairs Forms website. wishes consideration of an initial application for placement on the priority list for the next fiscal year. SF 424C, BUDGET INFORMATION-CONSTRUCTION PROGRAMS. Description and scope of the project, including project site description and location. immediately of any changes in who the state representative is and how to reach him or her. Demographic characteristics of the veteran population of the proposed catchments area. If great travel distances (over two hours) are imposed on veterans and their families, availability of beds. Number of VA nursing home and domiciliary beds and the occupancy rate at those facilities for the previous fiscal year. Number of state nursing home and domiciliary beds and the occupancy rate of those facilities for the previous fiscal year. Waiting lists for existing state home programs. Plans for acute medical care/emergency care services as may be required by the state home residents. Availability of qualified medical care personnel to staff the proposed facility. authorized state representative must certify compliance with this executive order. State application identifier number (if applicable). Schematic drawings for the proposed project. are 65 years of age and older and that there is a reasonable basis to conclude that the facility when complete will be fully occupied. Five-year capital plan for state's entire state home program, including the proposed project. Financial plan for state facility's first three years of operation following construction. determination of the priority of the initial application.